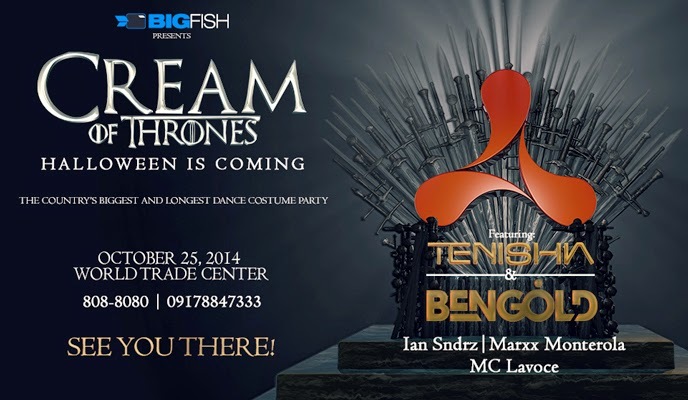 Tonight is the night of the most popular Halloween event in the Philippines. It's the Cream Halloween Ball but they're doing it slightly different now. This year they are paying homage to the most popular series in the US and dubbing this one as CREAM OF THRONES. This time, they're ushering in a great costumy event with full battle gears, royalty and sword wielding people at the World Trade Center. Spinning later is TENISHIA and BENGOLD. Also in the event are Ian Sndrz, Marxx Monterola and MC Lavoce so you'll never run out of music until the morning comes. Dress to impress but only with the Game of Thrones theme in mind. Who knows, you might find a queen too, not your sister! For tickets to the event, please go to the world trade center and purchase it there. There are no tickets released yet so don't be scammed! That easy.